You may have noticed an increasing focus in the UK media over the past few weeks surrounding the current grouse shooting season, which began yesterday. Regardless of where you sit on the game shooting fence, you can’t have failed to spot the various stories swirling around as conservationists, politicians and supermarkets line up to offer their position, opinion and recommendation for effective management of the industry. If you haven’t yet made up your mind how you feel about game shooting, or raptors, or even ethically sourced meat, the various news stories which have come out in recent weeks can be contradictory and confusing. Primarily however, the common focus for both NGOs and the media has been less around the actual shooting itself, but more on the fact that through poorly managed grouse estates, illegal persecution of birds of prey – such as the critically endangered hen harrier – has resulted in dwindling numbers of raptors across the UK. 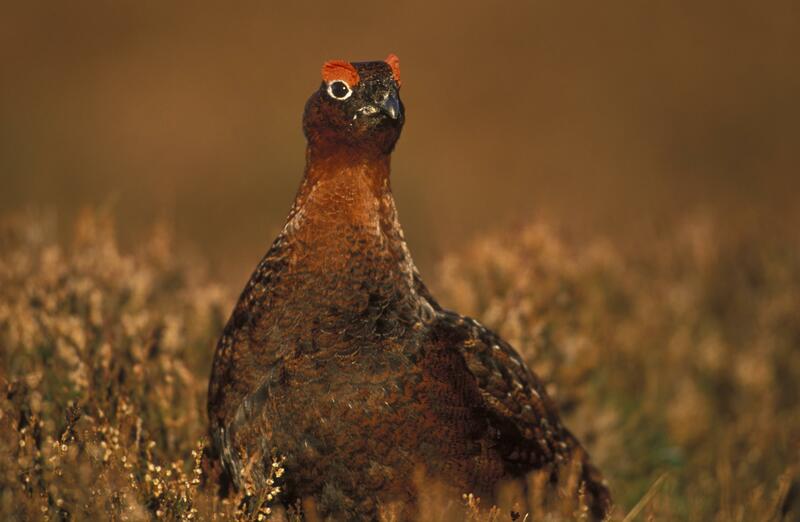 Marks and Spencer have announced it will not stock grouse this year because it can’t secure sufficient numbers of what it calls “responsibly sourced and third party accredited” red grouse. The company has said it wants to see more than just a ‘bare minimum’ of game suppliers complying with legislation. It is insisting that all grouse suppliers operate to the shooting industry’s Code of Good Shooting Practice and the DEFRA Codes of Practice for the Welfare of Game Birds. M&S have also said they are now working with RSPB and the Game and Wildlife Conservation Trust, to develop and implement their own responsible sourcing code for the industry which they claim will be ‘truly transformational’. Landowners and gamekeepers across Scotland meanwhile are reporting that the prospects for this year’s grouse shooting season are “unusually favourable“, due to the mild spring and warm summer which have resulted in high grouse numbers, as reported by the BBC. The landowners’ organisation, Scottish Land and Estates, said: “We got a nice dry spring, then no horrible weather through the hatching period in May. Everyone is optimistic for a very good season.” How lovely. Scottish Land and Estates and the Scottish Gamekeepers’ Association have repeatedly condemned raptor persecution, but environmental groups are saying they still have to do more to stamp out the practice. A network of conservation NGOs are coming together this month to speak out against the issue, using the start of the season to highlight the illegal persecution of birds of prey and claiming sporting estates and politicians could do more to end the practice. The coalition Birders Against Wildlife Crime, made up of former Conservation Director and leading activist Mark Avery, broadcaster and conservationist Chris Packham, the RSPB, and the North West Raptor Protection Group, has announced 10th August as ‘Hen Harrier Day’; an opportunity to raise awareness of the trapping, shooting and poisoning our raptors face as a result of badly managed grouse shooting estates and practices. I wholeheartedly condemn the appalling abuse of our incredible birds of prey. As someone who works for a number of wildlife conservation charities, I completely support every effort which is being made to try and protect our majestic raptors. Every day we are faced with harriers, eagles and buzzards being trapped, shot, poisoned and bludgeoned and it is both heartbreaking and unbelievably frustrating. The arrogant few who carry out these barbaric and illegal acts are a stain on our countryside and, I fully accept, do not represent the majority of estate managers who act within the law and with full respect for protected raptors. However, despite fully supporting efforts to introduce more ethical, sustainable methods for game shooting, I can’t help but feel the real victims are being missed here, and the real debate overlooked: the moral question over whether we should or shouldn’t be shooting game in the first place. Don’t get me wrong, I am not for one minute suggesting the raptor issue isn’t both topical and critical. Of course it is. I just find it disappointing that in all our anger and uproar towards the poisoning, shooting and trapping of birds of prey, both us and the media are giving little, or no, attention to the suffering experienced by the grouse, partridge and other game we repeatedly slaughter for our own entertainment. The League Against Cruel Sports, possibly one of the only major charities actually concerned with the grouse in all of this, recently called on the tourism agency VisitScotland to end the promotion of Scotland as a destination for driven grouse shooting. In response, VisitScotland refused, saying it must remain impartial and could not “discriminate” against one section of the tourism industry. Heaven forbid. So while, we continue to be up in arms about the birds of prey being decimated up and down our countryside, the fact remains that we’re not really angry about the suffering they are going through. After all, this isn’t an animal welfare issue, it’s a conservation one. An ideal world for most of those concerned would see more sustainable, ethical and effective game estate management, raptor numbers on the increase… and then we’d have no more issue, right? Except of course we will, as millions upon millions of birds will continue to be bred and butchered in the name of sport. While game estates do keep detailed records, these records are rarely made available to the public or even to the industry. An estimate by Animal Aid, however, puts the number each year at around 40 million. You have to wonder how the hell this cruel ‘sport’ can still be allowed to flourish up and down our countryside.